Diesel cardigan available at Brown Thomas. Right now, guys can’t go wrong with full on masculinity, we are seeing a real trend away from the metrosexual and androgynous looks of the recent past. Key colours of the season are grey, navy and camel. Tom Kelly, menswear buyer at Brown Thomas, has welcomed Victorian era inspired lean tailoring, shawl coloured double breasted cardigans, and Levi jeans into the mix this season and we love all the contrasting looks. Keep it clean and trim when buying a blazer or sports jacket. Farah and Gant are currently doing good examples, giving your torso good shape. With high armholes and slim sleeves, showing just a hint of muscle in silhouette and revealing just a bit of sleeve cuff, these jackets are a good option for virtually all guys, at any age. Gant has a smart blazer in navy corduroy (yes corduroy ) with narrow whales and good quality fabric that is foolproof for matching up with either your denims or flat front khakis. When picking out a jumper, look to Gant or Ralph Lauren for quality and colour. Make sure it is the right kind, slim cut, to fit as effortlessly over a dress shirt as it does under a jacket. The collar should be deep enough to expose some shirt but not too much. The body should end at your belt line, no lower. 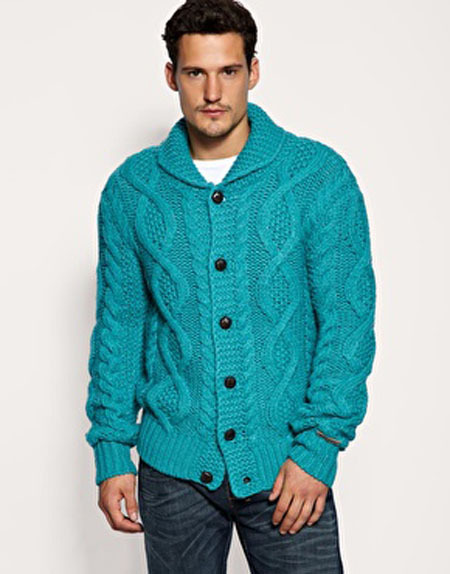 One look we love at the moment on our guys is the “shawl” collared cardigan and jumper. When wearing a cardigan always leave the bottom button undone, you want a sense of ease, not fussiness. The chunky knit is back and, whether plain or patterned, it is practical and bang on trend. Farah has a comprehensive collection at the moment, something for every guy’s taste. The right leather jacket is crucial in a man’s wardrobe; look for the right combination of luxe and tough. We like them finishing below the belt, too long or too short and it is just wrong. Think Steve McQueen, full of stylish attitude, pulling the collar of his leather jacket up as he walks out of the frame into the darkness. As far as suiting goes, Ted Baker does a gorgeous gunmetal grey suit from its Passion range. It is affordable and well cut, a wardrobe staple. Purple, a strong colour across all the collections, works well with gunmetal grey. It’s no secret we have a weakness for men in ties. Especially if they don’t normally wear one, nothing looks stronger or pulls a guy together quicker than the right tie. Woollen ties are marginally less formal than silk, but they also work well with suits made with shiny cloth, much the same way a shiny tie works well with fuzzy tweed jackets. Most European guys like a tie in a contrasting colour to the suit. Menswear has always been about balancing form and function, and it is almost impossible this autumn/winter to put a foot wrong.